The cause could be due to thin hair when combing or pulling hair too tight when dry with a blow dry. Without realizing it, regardless of the scalp hair and too often it did not rule out the hair becomes thinner. As we know thin hair is the start of symptoms balding hair. Of course, it should quickly be avoided before it gets worse. It is unfortunate, if it turned into a beautiful shiny hair became thin hair. Consumption of nutritious foods that contain lots of protein, because the elements of the hair protein. If less protein intake then your hair brittle and easily fall out easily. For that to keep hair healthy and strong, eat foods like eggs, fish, milk, cheese and lean meats. 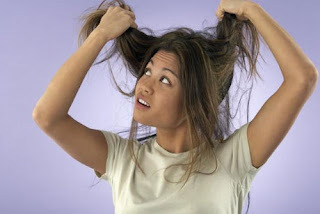 Tying hair too strong can lead to hair loss without the knowledge and being thin hair. For that, the hair should be binding uses a soft fabric to avoid using rubber as a hair tie. Naturopathy expert explained, one reason for hair loss is the amount of testosterone in the bloodstream. To maintain testosterone levels, you simply consume soy. The thyroid gland can also cause hair loss, if you have a doctor check it. Do a light massage on the scalp, this is to increase blood circulation. With the increased circulation of blood flow to the head can accelerate nutrients to the scalp so that hair grows normally. You can use stale tea while massaging. As expressed Steelsmith, decreased blood to the hair follicles causing hair loss. For that do head massages regularly at least 1 week. Such short article about a simple treatment for thinning hair. The treatment is simple, but can be prevented from thinning hair symptoms and do not require special treatment in the salon with expensive fees. Avoid bad habits and let's do a healthy lifestyle, a healthy lifestyle will affect the hair care. Very nice post regarding thin hair care. You are right tying tightly and up levels of testosterone hormone can lead to hair fall. Also Protein intake should be higher if we want to stop hair damage. Thanks for sharing such a nice post. In this blog given all information is informative and useful for Hair. Thank you for sharing such valuable information.